Gunupudi Bheemavaram is located in West Godavari district of Andhrapradesh in India. 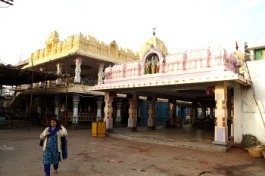 This place is well known for the temple Soma Rama which is considered as one of the Pancharama temples. The temple here is called Sri Someshwara Janardhana swamy. Very good bus and train facility is available to Bheemavaram from all other places of India. One more Pancharama Kshetra called Palakollu is located just 20Kms away. One more major city of West Godavari called Narsapur is 45Kms away from here and one of the tributory of Godavari called Vasishta Godavari meeting the sea is very nearby. This place is called Antarvedi. Very frequent buses run towards Narsapur from all other parts of Andhra Pradesh (by APSRTC). 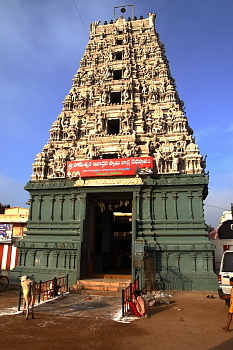 The temple is situated nearly one kilometer from bus stand. Take a cycle rikshaw or auto to reach there. One more temple called Goddess Maullamma is situated in the city itself. As per the local people, this temple has got lot of power and by visiting there, all wishes come true. The face of Shiva lingam in this Pancharama temple is called Sadyojathamukha Swaroopam. Mass marriages (especially during Shivarathri) are being conducted at this temple premesis. The local people say that couple getting married at this Pancharama place have a peaceful understanding life. The attraction of Bhimavaram is spiritual as the temple dedicated to Lord Shiva, Sri Someswara Janardhana swamy which is considered as one of the Pancharama Kshetras is situated here. The main contribution for temple construction was made by the King Chalukya Bheema during 4th century. The Shiva lingam is called someshwara as it is believed that this lingam has been installed by Lord Chandra. The colour of the linga is believed to change during full moon day and Amavasya. Over and above the Garbhalayam, Goddess Annapurna temple is situated, which is the speciality of this temple and cannot be seen anywhere else in India. This resembles the fact that Lord Shiva holds the Goddess Ganga on his head. To the South of the Garbha Gruham, Goddess Adilakshmi can be seen and wedding hall at ground and first floor are constructed. Marriages are conducted both in the new hall and also in Goddess Annapurna mantapam. To the East side of this temple, there is a Pushkarini pond which is also called Soma Gundam. Inside the temple, Lord Anjaneya Swamy, God Kumara Swamy, Navagraha, Sun God, Lord Ganesha can also be seen. In front of the main entrance, 15ft pillar is constructed. The temple timings are from 5.00am to 11.00am and 4.00pm to 8.00pm. 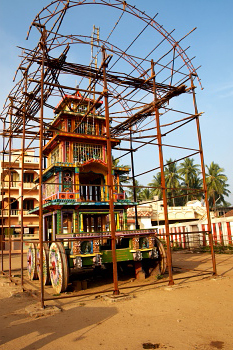 In the center of the city, the temple of Rain Goddess (Varala Thalli) Maullamma is situated. The statue is 8ft hight. 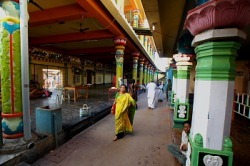 Each Fridays special poojas are performed at this temple. Yearly grand celeberations are held during Maha Shivarathri festival. Bhimavaram is 20 Kms from Palakollu. Palakollu is on the National Highway 214 located at interior Andhra Pradesh called Kona seema. This National highway starts at kathipudi (on National Highway 5) after Annavaram coming from Vizag and ends at National Highway 9 in between Vuyyuru and Machilipatnam. Excellent bus service available to Bhivaram from all parts of Andhra Pradesh moving towards Narsapur or Palakollu. Continuous buses available between Palakollu and Bhimavaram. Though the distance between Palakollu and Bhimavaram is only 20Kms, it takes 45minutes to reach. People travelling by road from Kolkata and Orissa side, have to reach Visakhapatnam and proceed in NH5 upto Ravulapalem. After Ravulapalem, take left turn where the boards points towards Narsapur. Palakollu is just 45minutes journey from this place via Siddhantam and Martair (Marteru). The distance between Ravulapalem and Vizag is 230Kms and 70Kms from Rajahmundry. From Palakollu proceed towards Bheemavaram which is only 20Kms. One more route to reach Bheemavaram from Visakhapatnam is to proceed upto Kathipudi on NH5 and take left turn. Reach kakinada in this route and proceed towards Rajole via yanam and Amalapuram. From Rajole make your journey towards Palakollu and then to Bhimavaram. From Kakinada, one can reach Bhimavaram via Ramachandrapuram, Ravulapalem and Palakollu also. There are only two bridges to cross River Godavari one at Yanam and the other near Ravulapalem. So, tourists have take either Yanam or Ravulapalem route. People travelling by bus from Hyderabad, Vijayawada and other parts of the country can travel upto Tadepalligudem on NH5 and take right diversion to reach Bhimavaram.